It's been a busy couple of weeks in the shop and over the weekends so I haven't had much time to update the blog. However, I have finished the Hobby Boss CH-46F Sea Knight. It's a Marines version so I have done it in Vietnam. Firstly the kit. It was a very nice kit to make - not one of the 'easy kit' Hobby Boss but a real one. It went together very easily. The only problems I had were with the rotors. The fitting of these is very flimsy and I ended up cutting them off and re-pinning with brass rod. I had great fun with the decals and ended up using a second kit as I kept destroying bits of them. Once finished and matt varnished, I noticed that one of the 'MARINES' decals had distorted so I had to take that area back to bare plastic and repaint. The Iwata did its usual trick and was absolutely superb in its control as I was respraying just the small area around the 'ES' without any overspray. The paddy field was made from the bristles of a 3" paint brush - bought as a set at the Pound Shop in Ipswich. I firstly coated the base with Vallejo Acrylic water, sprayed it with Tamiya Flat Earth and set the paint bristles, cut to length, into the wet acrylic. Once dry, I painted the bristles in a variety of greens, starting with Olive Drab. The last touch was to use a bottle of Vallejo 'Still Water', which is very runny and comes out of a very narrow nozzle, to run around all of the visible earth areas to make them shine as water. Lastly, I had to remove the bristles where the chopper sat so that it was sunk into the paddy field. I was casting around for some figures when Richard Langford offered me some Britannia Miniatures white metal US Vietnam Marines. The four he gave me are great. Two are running for the chopper, whilst one is carrying an injured colleague. the fourth is a chopper crew member giving covering fire - note his flight helmet and flak jacket. I am really pleased with this and shows how effective aircraft can be in a diorama. A few weeks ago, Lion Marc in Hongkong offered us a new kit by a company called Kinetic. It's an F-84F Thunderstreak. As this manufacturer was new to us, I decided that I would make one to see how they went together. So far I have finished the cockpit. 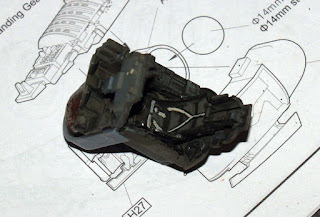 I am looking forward to doing the rest and intend to use Alclad for the first time in 1/48th. The cockpit has gone together very nicely. There is a bit of flash on the parts but nothing too dire. The instructions are very clear. The cockpit/gun compartment includes holders for two large ball bearings supplied as weights. I am going to make mine with the gun compartment and the air brakes open so that people can see the detail provided in the kit. As ever, it will be OOB so watch this space.